Guests who stay at this Prague hotel will find that they are just a short walk from Wenceslas Square. Visitors will be able to visit museums and historical attractions in the city. Those with rooms at the Radisson Blu Alcron Hotel Prague will also be able to find many places in the area to dine. Guests will find that many attractions are only a short walk from the conveniently located hotel. To reach areas that are not as close to the Radisson Blu Alcron Hotel Prague, guests can use public transportation. 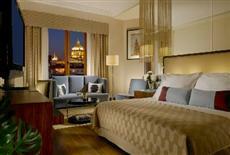 The rooms at the Radisson Blu Alcron Hotel Prague feature art deco style décor as well as en suite bathrooms. The rooms also contain large LCD TVs, heated bathroom floors, and a makeup mirror. The art deco hotel first opened in 1932 and underwent a recent renovation. The Radisson Blu Alcron Hotel Prague offers onsite dining options in the restaurants Alcron and La Rotonde. Guests will be able to have a drink at the Be Bop Bar as well. Visitors that want to keep in shape will be able to use the onsite fitness center, and they can relax in the sauna.